Registration: Register online by Wednesday, November 30. The Association of Research Libraries (ARL) is offering a series of webcasts that present the findings from the latest SPEC surveys and allow webcast participants to discuss trends with the survey authors. A 45-minute webcast will follow the publication of each SPEC Kit in 2016. 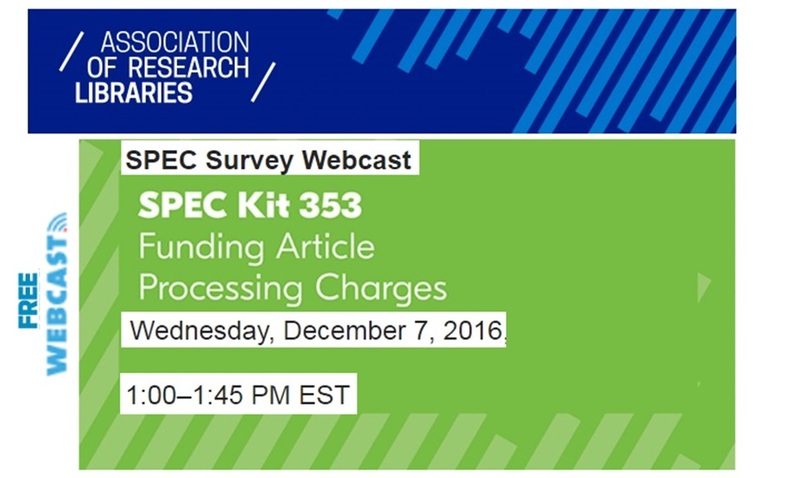 The next webcast in this series will cover the Funding Article Processing Charges (APCs) survey (SPEC Kit 353), which explores strategies ARL member institutions are using to address APCs, and describes and documents related policies and procedures. discuss the survey results in the context of APC support by academic libraries around the world. The webcast will encourage questions from participants throughout the presentation. Read the freely available SPEC Kit 353 in advance and have your questions ready.